High blood pressure is a common disease in which blood flows through blood vessels (arteries) at higher than normal pressures. 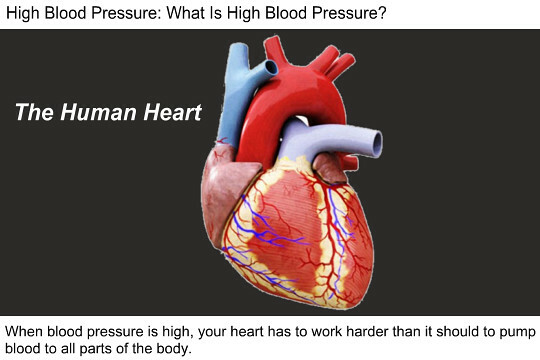 Blood pressure is the force of blood pushing against the walls of the blood vessels as the heart pumps blood. If your blood pressure rises and stays high over time, it’s called high blood pressure. High blood pressure is dangerous because it makes the heart work too hard, and the high force of the blood flow can harm arteries and organs such as the heart, kidneys, brain, and eyes. ◾Primary, or essential, high blood pressure is the most common type of high blood pressure. This type of high blood pressure tends to develop over years as a person ages. ◾Secondary high blood pressure is caused by another medical condition or use of certain medicines. This type usually resolves after the cause is treated or removed. Blood pressure is always given as two numbers, the systolic and diastolic pressures. Both are important. ◾Systolic Pressure is the pressure of blood against the artery walls when the heart beats. ◾ Diastolic Pressure is the pressure of blood against the artery walls when the heart is at rest between beats. Usually these numbers are written one above or before the other - for example, 120/80 mmHg. The top, or first, number is the systolic and the bottom, or second number, is the diastolic. If your blood pressure is 120/80, you say that it is "120 over 80." Blood pressure normally rises with age and body size. Newborn babies often have very low blood pressure numbers that are considered normal for babies, while older teens have numbers similar to adults. If either your systolic or diastolic blood pressure is higher than normal (120/80) but not high enough to be considered high blood pressure (140/90), you have pre-hypertension. Pre-hypertension is a top number between 120 and 139 or a bottom number between 80 and 89 mmHg. For example, blood pressure readings of 138/82, 128/70, or 115/86 are all in the "pre-hypertension" range. A systolic blood pressure of 140 mmHg or higher, or a diastolic blood pressure of 90 mmHg or higher, is considered high blood pressure, or hypertension. Hypertension is the medical term for high blood pressure. If you have diabetes or chronic kidney disease, your recommended blood pressure levels are a systolic blood pressure of 130 mmHg or lower, and a diastolic blood pressure of 80 mmHg or lower. High blood pressure is often called "the silent killer" because it usually has no symptoms. Occasionally, headaches may occur. Some people may not find out they have high blood pressure until they have trouble with their heart, kidneys, or eyes. When high blood pressure is not diagnosed and treated, it can lead to other life-threatening conditions, including heart attack, heart failure, stroke, and kidney failure. It can also lead to vision changes or blindness. ◾your heart to work too hard and become larger or weaker, which can lead to heart failure. ◾small bulges (aneurysms) to worsen in your blood vessels. Common locations for aneurysms are the aorta, which is the main artery from the heart; the arteries in your brain, legs, and intestines; and the artery leading to your spleen. ◾blood vessels in your kidneys to narrow, which can cause kidney failure. ◾blood vessels in your eyes to burst or bleed, which can cause vision changes and can result in blindness. ◾arteries throughout your body to "harden" faster, especially those in your heart, brain, kidneys, and legs. This can cause a heart attack, stroke, or kidney failure.